Composition is the placement or arrangement of visual elements or ingredients in a work of art or a photograph, as distinct from the subject of a work. It can also be thought of as the organization of the elements of art according to the principles of art. The term composition can apply to any work of art, from music to writing to photography, that is arranged or put together using conscious thought. Lines are the optical phenomena created when objects curve away from the viewer. Line-like shapes are considered line elements by the artist. Any such elements can be of dramatic use in the composition of the image. Less obvious lines can be created, which influence the direction of the viewer's gaze. These could be the borders of areas of differing color or contrast, or sequences of discrete elements, or the artist may exaggerate or create lines perhaps as part of his style, for this purpose. Many lines without a clear subject point suggest chaos in the image and may conflict with the mood the artist is trying to evoke. Straight lines are called linear when used in a piece of art work. Straight lines add affection and can make it look more detailed and challenging. Horizontal, vertical, and angled lines often contribute to creating different moods of a picture. The angle and the relationship to the size of the frame both work to determine the influence the line has on the image. They are also strongly influenced by tone, color, and repetition in relation to the rest of the photograph. Horizontal lines, commonly found in landscape photography, can give the impression of calm, tranquility, and space. An image filled with strong vertical lines tends to have the impression of height, and grandeur. Tightly angled convergent lines give a dynamic, lively, and active effect to the image whereas strongly angled, almost diagonal lines generally produce tension in the image. Viewpoint is very important when dealing with lines particularly in photography, because every different perspective elicits a different response to the photograph. By changing the perspective only by some degrees or some centimeters lines in images can change tremendously and a totally different feeling can be transported. Color is characterized by attributes such as hue, brightness, and saturation. Colors have been associated with different moods, dependent on the society of the time. 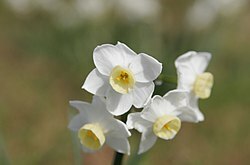 For example, white has long been viewed as purity, whereas it can also take slightly different meanings such as peace, or innocence. 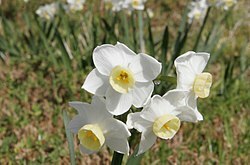 However, in some places (like for instance, Japan) it signifies death. The artist determines what the center of interest (focus in photography) of the art work will be, and composes the elements accordingly. The gaze of the viewer will then tend to linger over these points of interest. Elements are arranged with consideration of several factors (known variously as the principles of organization, principles of art, or principles of design) into a harmonious whole which works together to produce the desired statement – a phenomenon commonly referred to as unity. Such factors in composition should not be confused with the elements of art (or elements of design) themselves. For example, shape is an element; the usage of shape is characterized by various principles. In photography, altering the position of the camera can change the image so that the subject has fewer or more distractions with which to compete. This may be achieved by getting closer, moving laterally, tilting, panning, or moving the camera vertically. There are numerous approaches or "compositional techniques" to achieving a sense of unity within an artwork, depending on the goals of the artist. For example, a work of art is said to be aesthetically pleasing to the eye if the elements within the work are arranged in a balanced compositional way. However, there are artists such as Salvador Dalí whose sole aim is to disrupt traditional composition and challenge the viewer to rethink balance and design elements within art works. 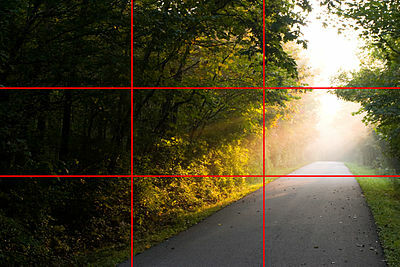 The rule of thirds is a guideline followed by some visual artists. The objective is to stop the subject(s) and areas of interest (such as the horizon) from bisecting the image, by placing them near one of the lines that would divide the image into three equal columns and rows, ideally near the intersection of those lines. The rule of thirds is thought to be a simplification of the golden mean. The golden mean is a ratio that has been used by visual artists for centuries as an aid to composition. When two things are in the proportion of 1:1.618 (approximately 3/8 to 5/8), they are said to be in the golden mean. Dividing the parts of an image according to this proportion helps to create a pleasing, balanced composition. The intersection points on a golden mean grid appear at 3/8 in and 3/8 down/up, rather than at 1/3 in and 1/3 down/up on the grid of thirds. The "rule of odds" states that by framing the object of interest in an artwork with an even number of surrounding objects, it becomes more comforting to the eye, thus creates a feeling of ease and pleasure. It is based on the assumption that humans tend to find visual images that reflect their own preferences/wishes in life more pleasing and attractive. The "rule of odds" suggests that an odd number of subjects in an image is more interesting than an even number. Thus if you have more than one subject in your picture, the suggestion is to choose an arrangement with at least three subjects. An even number of subjects produces symmetries in the image, which can appear less natural for a naturalistic, informal composition. An image of a person surrounded/framed by two other persons, for instance, where the person in the center is the object of interest in that image/artwork, is more likely to be perceived as friendly and comforting by the viewer, than an image of a single person with no significant surroundings. The rule of space applies to artwork (photography, advertising, illustration) picturing object(s) to which the artist wants to apply the illusion of movement, or which is supposed to create a contextual bubble in the viewer's mind. This can be achieved, for instance, by leaving white space in the direction the eyes of a portrayed person are looking, or, when picturing a runner, adding white space in front of him rather than behind him to indicate movement. The blurred background focuses the eye on the flowers. At a smaller aperture, the background competes for the viewer’s attention. A similar approach, given the right equipment, is to take advantage of the Scheimpflug principle to change the plane of focus. A simple composition with cloud and rooftop that creates asymmetry. Related to the rule of odds is the observation that triangles are an aesthetically pleasing implied shape within an image. In a canonically attractive face, the mouth and eyes fall within the corners of the area of an equilateral triangle. Paul Cézanne successfully used triangles in his compositions of still lifes. ↑ Dunstan, Bernard. (1979). Composing Your Paintings. London, Studio Vista. This page was last edited on 27 February 2013, at 22:35.